Raffles City Hangzhou was designed by UNStudio for real estate company CapitaLand. It is a sustainable urban hub for living, working and leisure located in Hangzhou, one of China's most picturesque cities. Situated 180 kilometres south-west of Shanghai, Hangzhou is one of China's most prosperous cities, especially renowned for its scenic landscapes. Located in Qianjiang New Town near the Qiantang River, this mixed-use development forms a prominent landmark in Hangzhou's new central business district, with a total area of almost 400,000 square metres spread across the two 250-metre towers, the podium building and the surrounding plaza. The Financial Street (Jing An) Centre consists of two office buildings, one high-end residential buildings and a boutique SOHO apartment unit. The programme is distributed within four individual volumes. The residential and office towers - linked by a ground floor retail layer - are placed across the site to optimise sun orientation and reduce the casting of shadows on the plot, while simultaneously reducing impact on the surrounding buildings. The facade design for Jing’An Plaza was developed around two principle elements. The horizontal ribbons that wrap around balconies and facade openings and the vertical shifts in the ribbons towards the main street which add a vertical articulation to the buildings and ground them on the site. Large glass openings allow natural light into the buildings, creating optimal interior lighting conditions for the different functions and ensuring spectacular city views. On the lower levels the buildings connect to a park setting with greenery and water features. 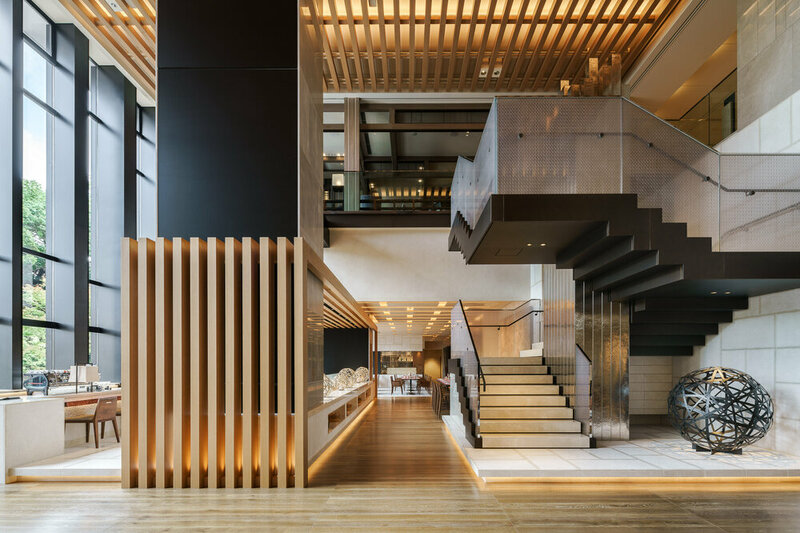 Located in North Point, the eastern district of Hong Kong Island, 18 King Wah Road is a new 23-​story office building in Hong Kong and second commission for Pelli Clarke Pelli Architects. 18 King Wah Road commands a striking view of Victoria Harbor and Kowloon Bay, and to the west, PCPA’s iconic International Financial Centre marks the skyline. In contrast to the density of its urban neighbors, the design of PCPA’s building is airy and buoyant. 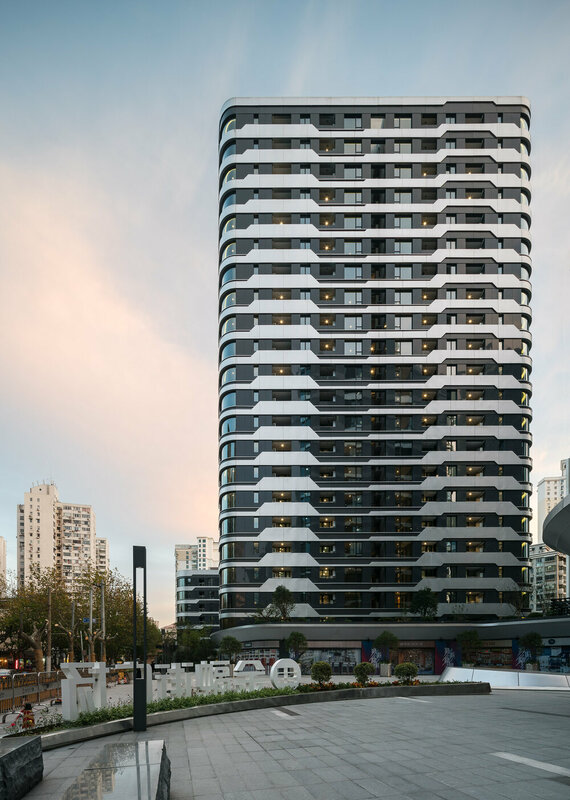 The triple-​height Y-​shaped columns that support the base of the tower deliver an exciting visual on the street, announcing the building’s presence. While solid in breadth, they seem to lift the base effortlessly. Metal fins wrap around the crisp glass and steel curtain wall, creating a lively pattern the full height of the building’s compact vertical massing. Each office floor will have spectacular views of the waterfront, Victoria Harbor and Kowloon Bay. The project meets Gold Well Building Standards, Platinum Asia Regional Intelligent Green Building, and LEED Platinum. Key environmental concerns such as dense urban congestion and extreme afternoon temperatures are addressed. The curved corners of the building allow air to flow continuously throughout the tightly built-​up neighborhood. High-​performance metal sunshades wrap the exterior of each floor to minimize the effect of the intense solar rays from overheating the interior spaces. The shades are designed to function specifically to the sun’s orientation. On the north-​west corner, they extend outwards and downward to mitigate the harsh afternoon sun. On the south-​west corner, a second shade extends out to block the higher angled mid-​day sun. 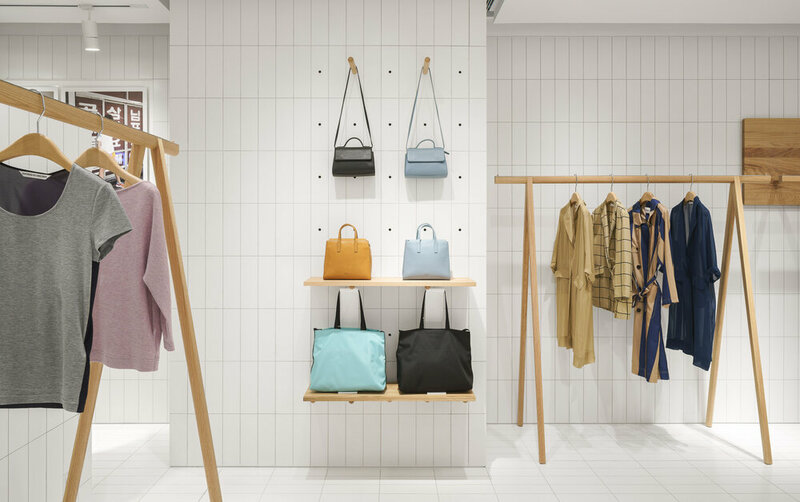 Concurrently, this second feature acts as a light-​shelf that directs daylight deeper into office interiors, significantly reducing the need for artificial lighting. 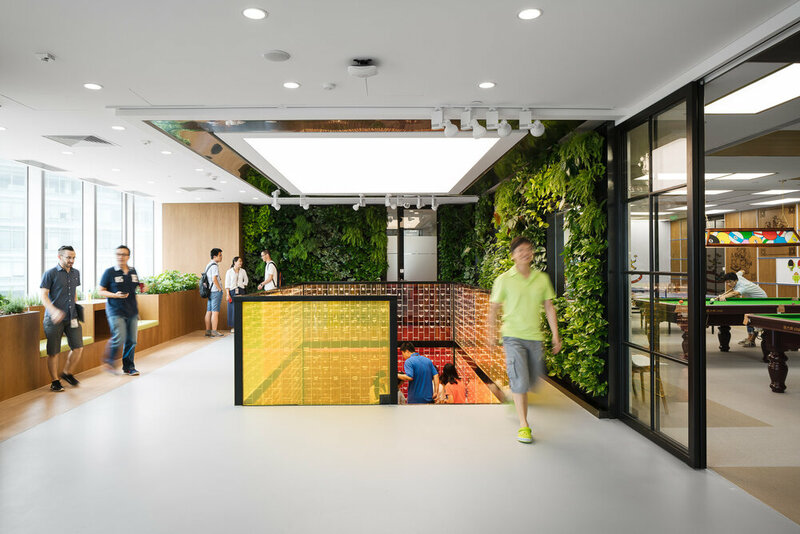 Abbott Customer Experience Center (CEC) in Shanghai, designed by M Moser Associates, a global architecture and interior design firm who pioneered the integrated approach to deliver effective workplaces. University of Chicago Booth School Interim Campus is located in the Cyberport area of Hong Kong Island. It is surrounded by lush green mountainscapes and beautiful ocean views. The design firm, Robarts Spaces, was inspired by the unique setting. Elements of bay, dock, ocean blue, and garden green were woven into the design and details of various areas. After ten years in the previous office, Google Beijing moved to a new location in Zhongguangcun, China's Silicon Valley. On the very first day of business, Googlers were thrilled with the new space and eager to test out the new facilities. On top of standard office facilities, the office also has a Google Museum, a game room, a colored glass stairwell that goes up a few floors, and many more exciting features. Sangha Retreat by Octave is a life learning and wellness community on the shores of beautiful Yangcheng Lake, Suzhou. Sangha seeks to re-establish the connection and unity between people and the inner self, others, and nature. One of the best and largest of wellness centers in China, it offers an eclectic selection of premium lifelong learning and wellness programs, ranging from wellness spa packages to fully-serviced hotels and lakeside villas, with custom medical evaluation and services, body training, early education and a gourmet restaurant as part of the experience. 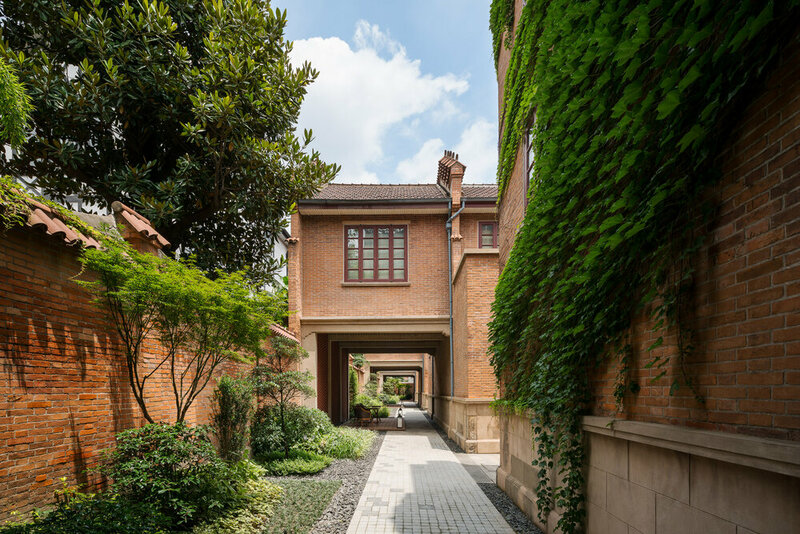 With lifelong learning standing at the center of the idea, Sangha exults in the serendipity and quietude it enjoys as an ex-urban resort, while enjoys convenient transportation to nearby cities – 15 minutes’ drive to Suzhou, 1 hour or so to Shanghai. Here, within a surrealistically beautiful surrounding, take a retreat from fully-packed schedule and enjoy a moment of calm and intimacy. Meet like-minded friends at Sangha and embark on a journey of body, mind and spirit discovery and bonding. The design of the resort was overseen by New York based design firm TsAO & McKOWN. 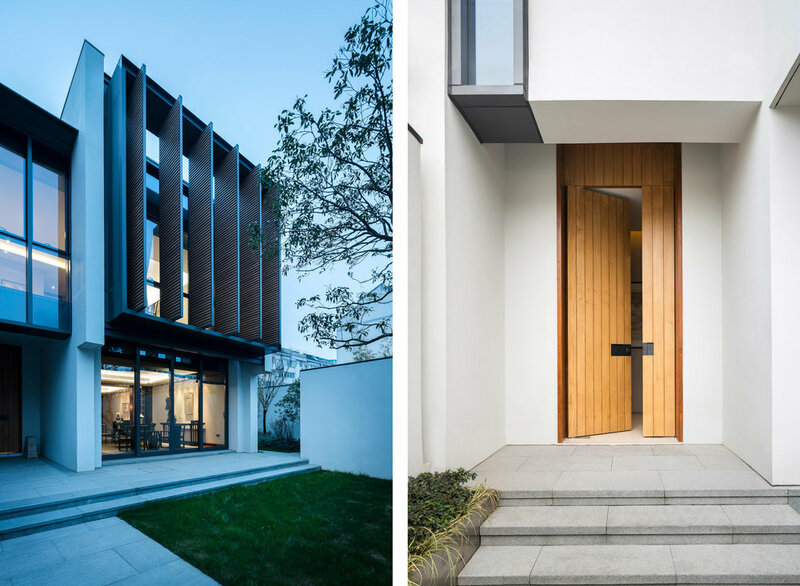 Designed by Singapore architecture firm SCDA, Jinghope Villas are located in close proximity to the world-famous Humble Administrator's Garden in the city of Suzhou. The villa exteriors incorporate features of traditional architecture from this region. White walls together with dark grey accents present a simple and elegant Suzhou style. The interior decor of the villas exemplifies contemporary Asian design styles. SCDA is a multi-disciplinary architectural practice established in 1995. Principal, Chan Soo Khian was the recipient of the inaugural President’s Design Award, Singapore Designer of the Year and is part of the Panel of Designers for Poliform in Milan. The design of the resort was overseen by New York-based design firm TsAO & McKOWN. 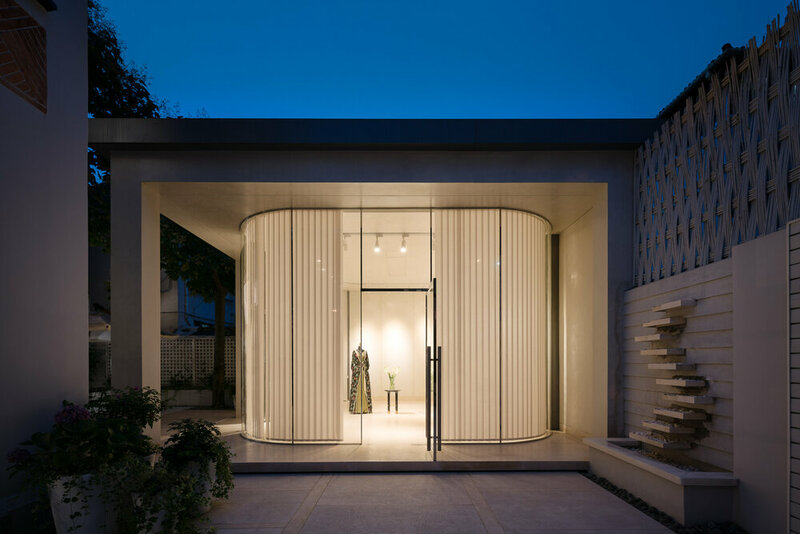 The interior of the villa was designed by Shanghai-based design practice Neri & Hu. 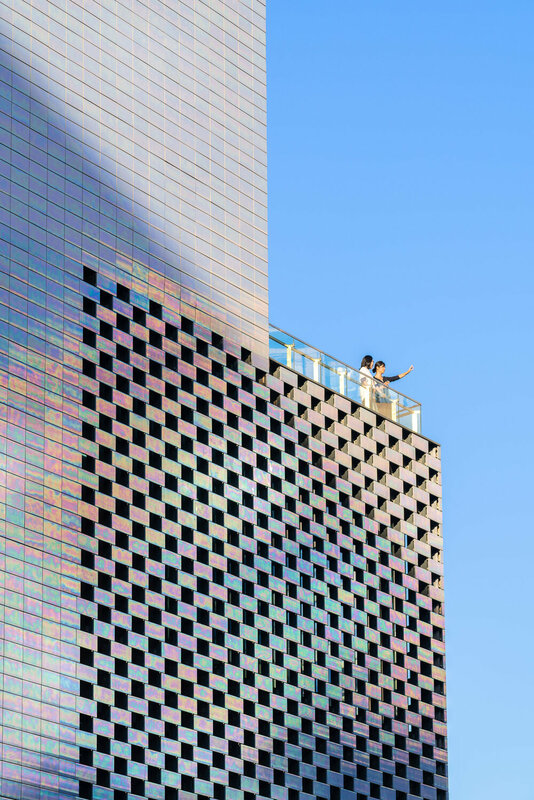 Designed by Dutch architecture firm UNStudio, this mirror lane installation conceptually explores the symbiotic relationship of cultural reflections that occur between the city's occupants and urban landscape. It frames the entrance of the Xintiandi Style Retail Mall and twists through the space in one long architectural gesture.